This is a recipe for homemade enchilada sauce recipe. Actually, the Best Homemade Enchilada Sauce. 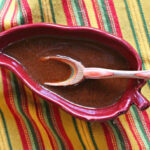 Deep red in color and with deep earthy flavors, this is the only enchilada sauce recipe you’ll need. Well here I go again, calling something “the best.” I don’t like doing it. Everyone’s tastes are different, it’s always a matter of opinion. It’s subjective. 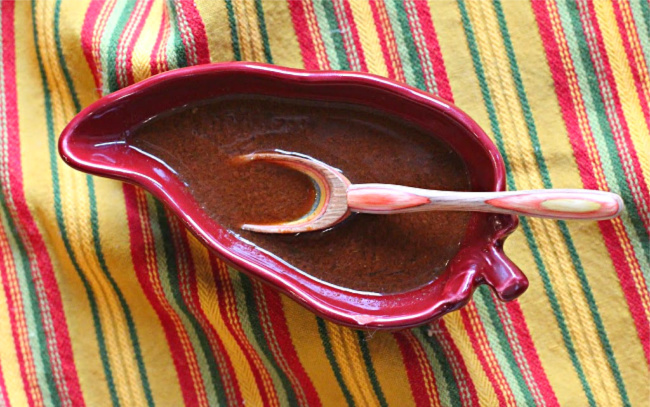 But in my book, this is the best homemade enchilada sauce recipe I’ve found. It comes from our friend Greg. 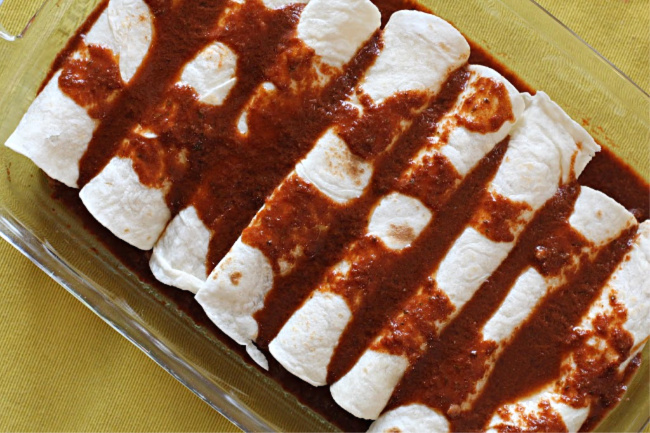 We had it at their house, a rich beautiful brick red saucy blanket over pulled pork enchiladas. And pork that was smoked mind you. Oh-my…g-o-o-d-n-e-s-s good. Nothing fancy. I just use Hershey’s Cocoa. This is an easy sauce to make. One pan, stovetop, and with ingredients you probably already have in your pantry. The recipe calls for three tablespoons of chile powder. With a broad range of pure ground chile powders available, you can make this as spicy or as tame as you want. Ancho chile pepper is a milder powder that delivers lots of chile flavor. I like using New Mexico Chile powder. Chimayo, which can be quite spicy, is my favorite. I’d test the waters if I were you, adding a tablespoon at a time, tasting as you go, until you reach the power you’re looking for. Here’s this enchilada sauce in action. I’ve made beef and bean burritos and generously bathed them with the sauce before heaping on plenty of cheese. I’ll be posting this recipe very soon. In the meantime, I used this homemade enchilada sauce for my Chorizo Chile Stuffed Chicken Breast. I hope you give this homemade enchilada sauce recipe a try, and if you do, please come back and give the recipe a star rating. I appreciate the feedback and always love hearing from my readers. Homemade is always best. 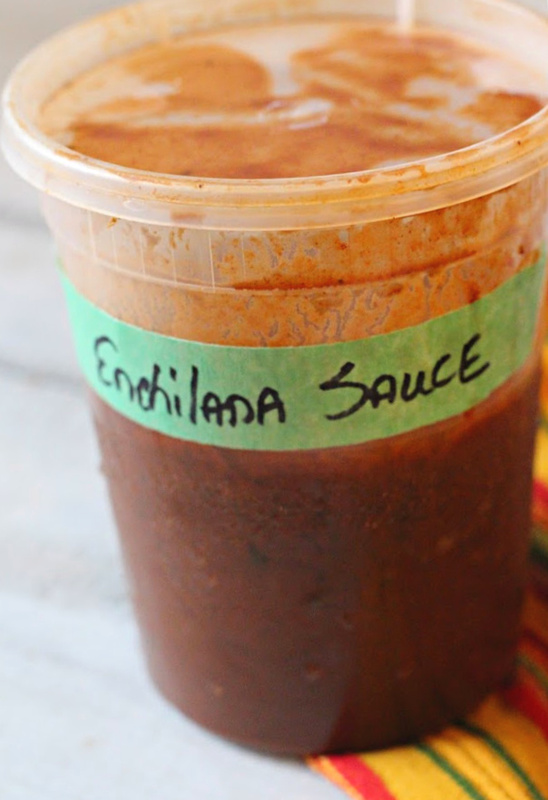 And this easy recipe for homemade enchilada sauce will find you swimming in exciting flavor. Pour into pan and add the rest of water. Oh I could easily pour some of this over a smoked pork burrito. In fact we still have some smoked pork in the freezer and what a perfect way to use it. I like making sauces like this with a mix of chile powders, Chimayo definitely being one of them . 🙂 You know, come this thing of it, I can’t remember that last time I made an “enchilada sauce”. Normally I just use a red chile sauce for my dishes, the difference being no tomatoes. Sounds like it’s time to switch tings up a bit. Thanks Lea Ann! Thanks so much for the recipe! I would never doubt your opinion as to it being the ‘best’ because I know you know Southwest and Mexican food!